Notes: Some elements of this series are inspired by the Jules Verne novel 20,000 Leagues Under the Sea, as well as the Studio Ghibli film Castle in the Sky. It's the year 1889. A young orphaned inventor, Jean Luc L'artigue, is competing in a glider-design contest in his hometown of Paris. While tinkering with his glider, he meets a fellow orphan, a circus acrobat named Nadia who has a pet lion cub named King. One thing leads to another, and soon Nadia and Jean are on the run from a trio of jewel thieves who are trying to steal from Nadia her heirloom necklace; the necklace itself, a pendant called the Blue Water, seems to have some mysterious power that only Nadia can summon. Soon, the kids find themselves aboard an American ship that's looking for the sea monster that's been nailing boats around the world for quite some time. Before their adventure is over, Jean and Nadia will discover the truth about these mysterious sinkings, board the world's biggest submarine, fight a tremendous multinational conspiracy with designs on ruling the world, get marooned on an isolated island, and (of course) fall in love. I've been struggling with this for years. You see, I like Nadia quite a bit, but I simply can't find it in myself to justify a five-star rating for this show, because of a nagging and persistent flaw that grows more glaring with each revisit. 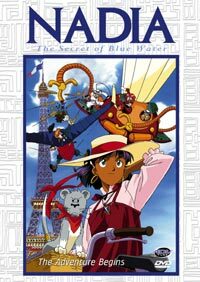 The basic premise remains pretty solid: Nadia: The Secret of Blue Water is indeed a fantastic swashbuckling adventure with a cast of often loopy, always energetic characters that deserve to be lauded, and Hideaki Anno does a great job of building the story up into something of an anime epic by the end. So why doesn't it remain at the top of the pack? From episodes 23 to 34, Anno essentially handed the reins over to talented artist and tokusatsu special effects wizard Shinji Higuchi, noted for his work on Gamera, and, incidentally, the namesake for the lead in Evangelion. Unfortunately, his directing in this case leaves much to be desired: maybe only two of the nearly dozen episodes involved are worth watching, the rest essentially wasted due to abysmally poor plotting and animation, with characters acting like caricatures of themselves (Nadia herself especially devolving immensely) and indulging in cringeworthy slapstick that is utterly out-of-place compared to the series up to that point. When you consider this was originally a weekly show and therefore Nadia got saddled with this garbage for nearly three months, it becomes hard to justify a perfect rating in my book: to steal a term from TVTropes, it's a "Big-Lipped Alligator Moment" that drags on for a good five hours of screentime, made worse by the fact that when Anno finally got back, he ostensibly slapped Shinji something fierce up the back-side of his head and proceeded to forget any of this arc ever happened. As should we, I guess, but what's filmed is filmed! There is still much to champion in this series, though: Nadia and Jean-Luc are fantastic young leads, and Grandis in particular chews a ton of scenery any time she's on set. Even though the animation is a bit dated now (and the music even more so, as it reminds us "Don't forget to try in mind" ... whatever that means), the art remains vibrant and at times beautiful, the design work is equal parts steampunk and Space Cruiser Yamato, and naturally, anyone who enjoys the stories of Jules Verne should have this on their shelf, full stop. One of the great misconceptions about this series is that it's primarily a steampunk / science-fiction action show, when in fact it is ultimately a vehicle for the blossoming young love of the two leads -- much like Gunbuster is really a coming-of-age story and Evangelion is really a psychological sketch, both of which interrupted at times by sweet mecha action. That's not to say that Nadia's acrobatics and Jean-Luc's inventiveness aren't part of the charm (much less the utter, sheer badassness that is Captain Nemo), but this clearly has "young teen romance" written all over it just as indelibly as Sword Art Online twenty years later. Remember though: even despite the flawed and largely indefensible Island Arc essentially destroying its pacing, this series did win the 1990 Animage Anime Grand Prix and for good reason. It's fair to say that Nadia has lost a bit of shine in the ensuing decades since its inception, but whereas some series merely tarnish with age, one might call most of this series coated in exquisite patina. Recommended Audience: This series was originally commissioned to run on NHK, which is the Japanese equivalent of the American PBS. As such, it's generally suitable for all ages, although there are a few moments of relatively harmless sexual innuendo. Near the end, there are some scenes of violence that may scare younger viewers.